Implant losses are divided into those occurring within a window of up to one year (early implant loss) and those occurring after one year (late implant loss) (ZITZMANN & BERGLUNDH, 2008). Peri-implantitis usually leads to a late loss situation, whereas mechanostatic factors usually result in an early loss situation. Inadequate patient compliance and ineffective oral hygiene. This includes failing to attend recall examinations following the implant placement. Existing periodontitis and smoking status increases peri-implantitis by 4.7 to 4.6 times respectively (WALLOWY, 2012). Over an observation period of 10 years, previously eliminated bacterial strains of A. actinomycetemcomitans and P. gingivalis could be detected again on the oral mucosa of periodontitis patients (ZITZMANN & BERGLUNDH, 2008). On the other hand, P. intermedia was detected throughout. This suggests that the bacteria survive in niches with the reappearance of the same microflora as before the extraction, whereas resective therapeutic procedures (gingivectomy and open curettage) with existing periodontitis led to consistently low level immune responses at the extraction site compared to non-resective procedures (open root planing). In particular, the remaining teeth must be considered a potential source of infection during therapy procedures. For diagnostic purposes, the matrix metalloproteinase-8 (MMP-8) may be elevated by up to 971% in peri-implantitis compared to healthy teeth (XU et al., 2008; SORSA et al., 2011; SORSA et al., 2010). Peri-implantitis induced by ‘cementitis’ occurs in almost one in 5 implants, with removal of the residual cement leading to reduction in the inflammatory reaction of almost 60% (KORSCH et al., 2014). Regarding residual cement, LINKEVICIUS et al. (2013) demonstrated obligatory development of peri-implantitis in a patient collective with a history of periodontitis (100%). In patients with no history of periodontitis, residual cement favours the development of peri-implantitis in 65% of cases. Differentiation using characteristic probing pocket depths must be considered an obligatory cofactor (SCHWARZ & BECKER, 2013; HEITZ-MAYFIELD, 2008). Any probing should use minimal force while noting that ‘platform switch’ abutments, in which the abutment diameter is less than that of the implant diameter, make probing more difficult and can thus conceal the true extent of peri-implantitis (SCHLOTTIG, 2011; AL-NSOUR et al., 2012). 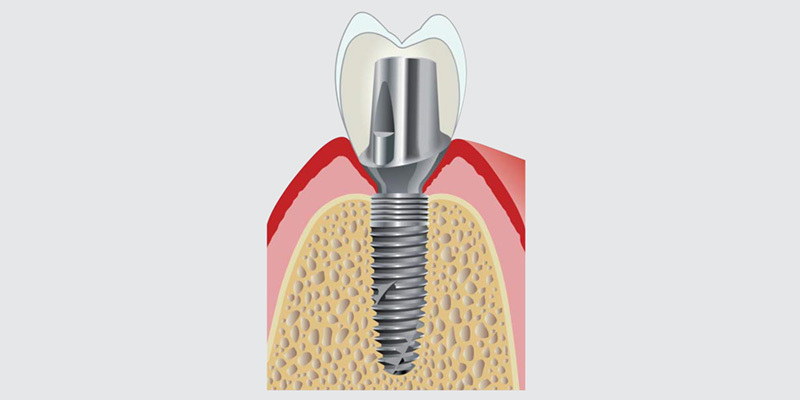 Thus implants > 10 mm with a square thread design have higher success rates than smaller implant lengths or shapes without a thread or sawtooth thread (STEIGENGA et al., 2003; GEORGIOPOULOS et al., 2007). Rough implant surfaces of > 2 μm also appear to have better osseointegration than smooth (< 0.5 μm) or moderate surfaces (1–2 μm) although more studies are required because of controversial findings (SCHLOTTIG, 2011). With forces of more than 1300 Newton developing in the jaw joint, in the first few months healing implants can be shifted or moved by an average of 100 micrometres even with sagittally directed forces of just 50 N on average (FLANAGAN et al., 2009). These mean reference forces increase to 87 N with articulation angles of up to 60° in the horizontal. As another preventive measure, implant systems with an internal junction and a microgap displaced inwards are preferable (Fig. 2) (WALLOWY, 2012). However, the most important criterion remains best hygienic practice and consideration of all surgical preventive measures. The effect of the microarchitecture of the different implant shoulder designs on the crestal bone level and the appearance of plaque accumulations are also discussed (HERMANN et al., 2011; SUBRAMI et al., 2009). Implant systems with microstructured shoulder zones are intended to create favourable factors for bone regeneration because of the rough surface and are therefore associated with reduced crestal bone loss (HERMANN et al., 2011) (Fig. 3; B, b). Machined implant shoulders, on the other hand, are intended to minimise plaque accumulation and the associated risk of infection in comparison to rough surfaces (SUBRAMI et al., 2009; QUIRYNEN et al., 1996) (Fig. 3; A, a). A recent Close Up review work by FIENITZ (2014, accepted) concluded that for endodontic implants a compromise between rough surfaces that encourage bone regeneration and smooth surfaces that are more resistant to biofilms must be found in accordance with the experience of the dentist and patients’ requests and compliance while taking into account other risk factors in peri-implantitis processes. So-called reference parameters (‘zero hour’) and clear follow-up processes with detailed documentation are essential for holistic therapy and recall examinations. Pre-, intra- and post-implant radiographic examinations must be used as reference parameters when recording the intra-implant site in which peri-implant inflammatory processes can be seen as radiolucent zones with respect to elevated bone resorption rates (WALLOWY, 2012). A recall examination should include determining the probing pocket depths and settling the next appointment along with advice, training and professional teeth cleaning. Bleeding, swelling and redness observed during the macroscopic manual probing suggest by definition possible peri-implantitis.